The greatest chalenge for me was this vector! 14 days spent to make it(not working day and night,around 3 hours a day). I liked this scan so much i had to make wlp with it. (It's the same). my opinion: I think that i did those *thick lines* everyone is doing,but i lost my patience and i made some lines bold.but not on the characters.I wanted to put some text but i couldnt find any place that would be good enough. ( i used pine trees and snow)..I'm under winter influence. HAPPY NEW YEAR, MY DEAR FRIENDS! (i know New Year is for 2 weeks and i wanted to upload it then but here it is) Hope you like it guys! Very, very neat vector! The characters are flawless and the line art is so neat 0_0 The lighting is fab and the only things that bother me are the trees: I think that the way we can see other trees behind the front trees is a bit weird. Other than that though, excellent job! O.O Whoa. Beautiful! I love the vector, which looks really neat. I love the candle lighting. Amazing job! *Gasp* I never expected someone to vector this when I first saw it and I was wrong. 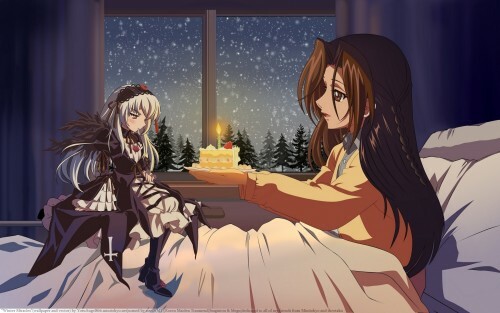 I love the lighting effect and Sugintou is just too cute the way she looks at the cake. A definite fave for me! I like it- it's especially good because it's fitting for the time of season, as well. I agree with Chloe on the trees, but everything else looks great. Keep it up! Beautiful, shows great emotion, I like your vector, it's really perfectly sweet! great job on making it into a nice wall. Now that is one amazing wallpaper. I can't find anything wrong about it, it's perfect! T_T come on, not again! someone vector scan I wanted to. looks like were having race on MT, who vector scan first XD. OMG, this is wonderful present. thank You so much, now I wouldn't dare to vector it. Your version is perfect, deep bow! Lovely wallpaper! This wallie is really your best work! Fabulous vector, especially well done! Really neat and I love everything, especially the lighting... Love this, fav this, use this! wow it looks great, you really must have worked hard on it.